The beautiful Kingston North American hardwood 3-in-1 pedestal table in Walnut finish instantly enhances the look of your game room. Save space while multiplying the fun as the standard dining table easily converts to a poker table and bumper pool table. With a full 48-in diameter table top, you can fit up to 8 people for a friendly poker game, board game, or a relaxing dinner. This durable hardwood table with a beautiful inlaid top will last for years to come. The poker table features a plush, padded, easy-to-clean black leather like playing surface, and includes rubber cup holder inserts to protect the wood finish. Kingston matching arm chairs sold separately. The Dynasty 54-in Foosball table is guaranteed to bring hours of recreational fun and playful competition right into the comfort of your home. This table is perfect for players of all ages. The cabinet is constructed from durable CARB certified MDF material and supported by 4 sturdy L-shaped legs with 4-in adjustable leg levelers to keep your table balanced on any surface. Players are made from durable ABS plastic, including a 3-man goalie configuration that heightens the level of competitive table play. Convenient built-in goal boxes help keep the ball in play and the abacus-style slide scorers make keeping score effortless. The attractive dark Cherry exterior cabinet and Black legs combine to create an elegant looking table that plays great. 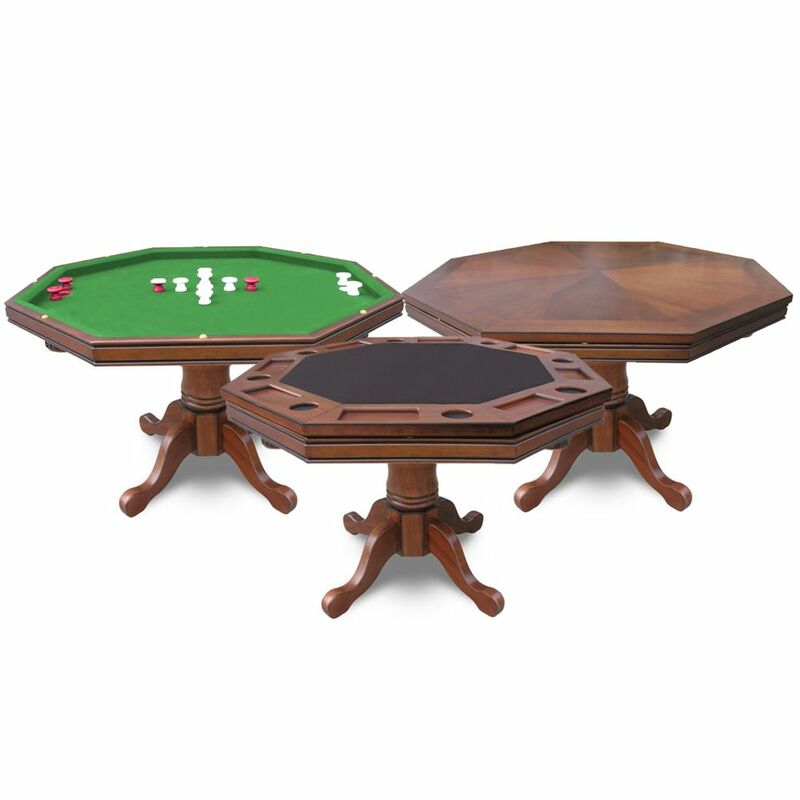 The Dynasty table is an excellent addition to any family game room, garage or man cave. Includes 2 quality foosballs. 180-day limited warranty. Kingston Walnut 3-in-1 Poker Table The beautiful Kingston North American hardwood 3-in-1 pedestal table in Walnut finish instantly enhances the look of your game room. Save space while multiplying the fun as the standard dining table easily converts to a poker table and bumper pool table. With a full 48-in diameter table top, you can fit up to 8 people for a friendly poker game, board game, or a relaxing dinner. This durable hardwood table with a beautiful inlaid top will last for years to come. The poker table features a plush, padded, easy-to-clean black leather like playing surface, and includes rubber cup holder inserts to protect the wood finish. Kingston matching arm chairs sold separately. Kingston Walnut 3-in-1 Poker Table is rated 5.0 out of 5 by 3. Rated 5 out of 5 by AlysssaL from We really like this table! Nice color, heavy construction, looks... We really like this table! Nice color, heavy construction, looks great! We bought coordinating chairs and the set looks great! Minor imperfections but we are happy with this set! Rated 5 out of 5 by piplance from Easy to assemble and lots fun using....highly recommend!! Easy to assemble and lots fun using....highly recommend! !